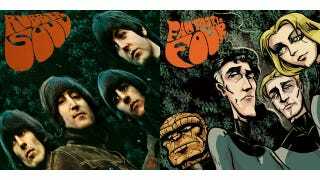 Last week's edition of the always stellar The Line It is Drawn art mashup series at Comics Should Be Good made the Fantastic Four as big as the Beatles. The brilliant fanartists took up the challenge of CSBG readers to place superheroes on album covers, casting the Teen Titans as Gorillaz, the various Robins as the Ramones, and a whole heap of Jack Kirby's comic book children as Sergeant Pepper's Lonely Heart Club Band. Head over to CSBG to see the capes and spandex crowd take on Michael Jackson, the Spice Girls, Bob Dylan, and even more Beatles albums. Top image by Paul Hostetler.